It’s the power of one. 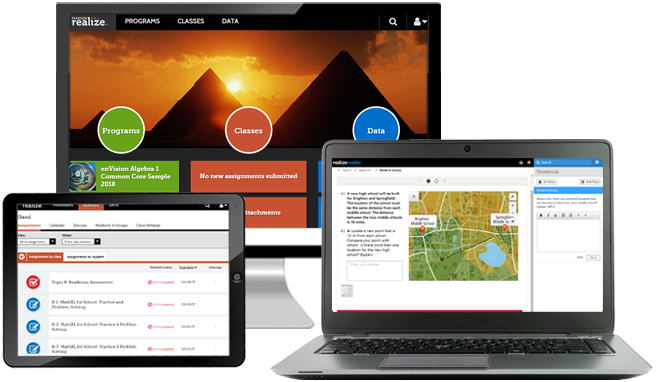 Pearson Realize™ is home to more than 850 programs across all subject areas and grade levels. 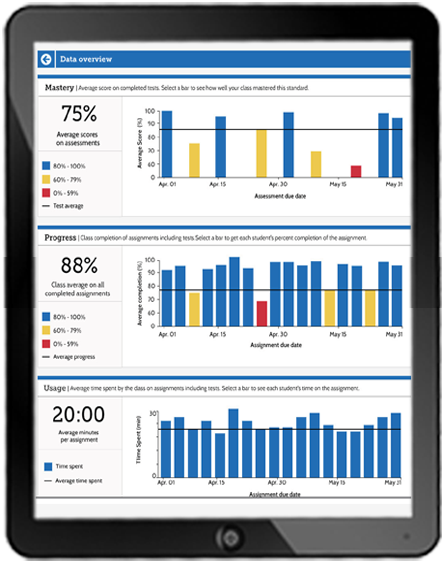 Access everything in one place with a single sign-on, and make it your own by adding content, rearranging lessons, editing tests, and selecting assignments. You can also embed OpenEd videos, hyperlink text, or insert files directly from Google Docs™ and Microsoft® OneDrive. Realize transforms learning into an active and engaging experience. Get to know how easy and flexible Realize is. Teachers and administrators can sign up for a free, 30-day trial. Realize the possibilities. 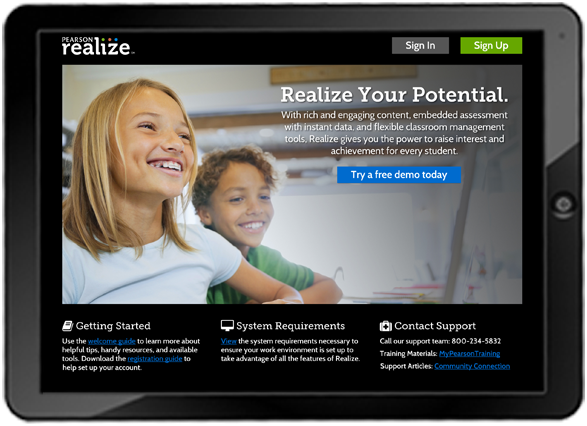 Realize supports the widest variety of digital devices, including Chromebook™, iPad®, and Android™ tablets. Take our digital textbooks with you on the go! 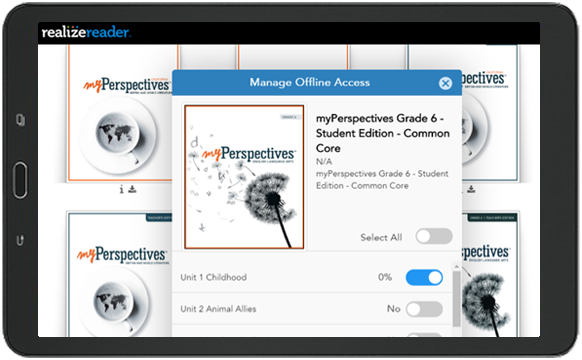 Realize Reader gives students access to assignments, content, and multimedia in both online and offline states. Submit assignments on Realize. Everything syncs up when reconnected to the web. Search OpenEd’s standard-aligned, efficacy-ranked open educational resources and assign them with one click. Single sign-on, single-click assignments make it easy to add thousands of vetted academic resources. Welcome Early Learners at the Flip of a Switch! 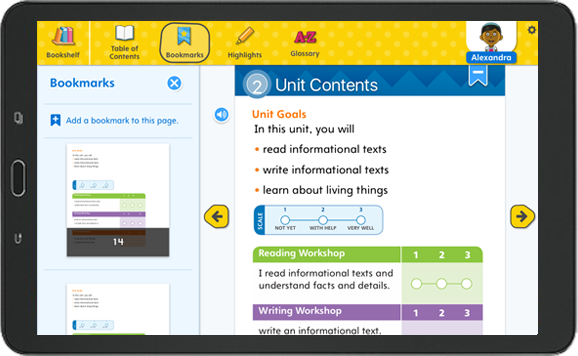 Easier navigation, bigger and bolder buttons, and student avatars make learning fun and age appropriate. Now you can transform Realize for early learners! Children can listen to songs and books, enjoy reading, play interactive games, and more! This is the way a children’s learning environment should be.